Azure Series Entry Level Stainless Indicator. 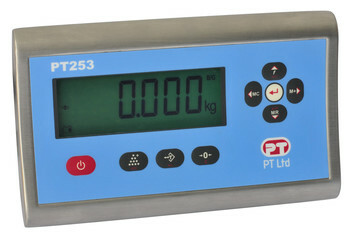 The PT253 is a low cost, high quality general purpose weighing indicator for industry in a durable stainless steel housing. The PT253 is approved by Weights & Measures Authorities for use in Accuracy Class III applications with 6000 and 2x 6000 intervals in accordance with OIML R76. Weighing, Counting, Check weighing and Dynamic Weighing for animals are standard as is printing selectable from five languages. It has 100 memory locations for Average Part Weight for Counting and 100 product memories for check weighing. Under, OK, Over Status bars and programmable buzzer for operator prompting are available for check weighing. Easy and practical operation via navigation keys with two programmable function keys and 25mm high digits and wide viewing angle, multi-colour backlit LCD display. The PT253 can even be configured as a remote display for Azure instruments. The PT253 is powered by AC power and internal re-chargeable Li-ion long life battery. Operating Environment: -15ºC to +55ºC; max. 85% RH, non-condensing. IP65 with front panel sealing. Calibration: Calibration can be performed with or without load cell non-linearity correction. Adaptive digital filter adjustable in 4 steps for dynamic (animal) weighing. Weighing Functions: Taring, zeroing, auto zero tracking, motion detection, auto zero at power up, increased resolution, unit change, temporary gross weight indication, dynamic(animal) weighing. RS-232: 1200 to 115200 baud, 8N1. 2nd RS232 available as an option (transmit only). Print ticket format: Programmable for different weighing modes. Format may include Date, Time, Ticket No, Gross, Tare and Net weights, Quantity. Label (print ticket) count number can be Preset. Click on the individual products below for more details, documentation, accessories and related products.